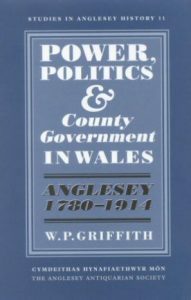 This is a study of public administration at the county level in Wales during the course of the ‘long’ nineteenth century. It couples a detailed examination of what transpired in one particular county, Anglesey, with overviews of events in other parts of Wales. Reference is also made to interpretive studies of English local government. Dr William Griffith is a native of Holyhead and was educated at Holyhead County Secondary School and the University College of Swansea. He has researched and published works on early modern Wales, notably Learning, Law and Religion: Higher Education and Welsh Society 1540-1640 (Cardiff, 1996). More recently he has been researching various aspects of modern Wales and is participating in the history of Welsh devolution project funded by the Economic and Social Research Council. He is Senior Lecturer in the Department of History & Welsh History at the University of Wales, Bangor, and is currently head of the department.